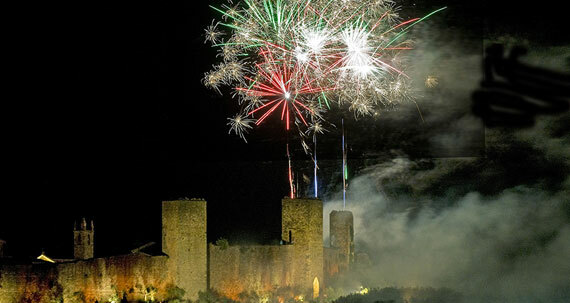 The small, medieval walled town of Monteriggioni near Siena every July organizes one of the best medieval fairs in all of Italy. We love traveling “back in time”, especially when it is in such a beautiful, and time appropriate, setting as is this small fortified village set upon a hill. Monteriggioni, di Torri si Incorona – which means, Monteriggioni, Crowned by Towers, perfectly describes this charming town whose walls still stand, with its 14 towers still standing (although a few no longer rise taller than the walls). 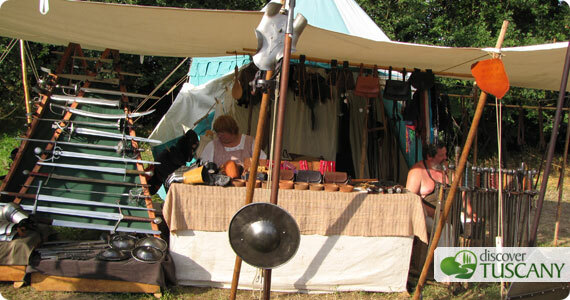 This year, in its 25th year, the medieval festival has been organized over 3 weekends: June 27-28, with a medieval tournament taking place below the castle (which we reminded you of last Friday but couldn’t go to 🙁 ) and the two weekends of July 3-4-5 and July 10-11-12, with the medieval fair inside the castle and each weekend having a different theme. The first, the Sacred, the second, the Profane. We’re heading there this Friday and will be able to see what how the “sacred” is interpreted. The program reads that there will be particular attention paid to music and spirituality, including the crafts stands which will include lute makers, intarsia makers, painters of religious images, stands selling reliquaries, poets and singers. The second weekend, of the profane, will instead focus on that which was different, marvelous and stupefying. In medieval times, the line between nature and supernaturals was quite hazy where something oiut of the ordinary could well be considered the Devil’s work, an illusion made to deceive. 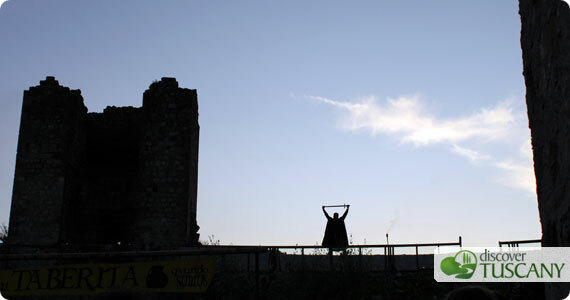 So the second weekend should be quite magical, with shows showing magic, diabolical marvels…. Of special note: on July 10, Angelo Branduardi will be on stage starting at 10pm. The Italian folk/folk rock singer-songwriter and composer is a definite attraction for anyone who knows his work, so now we are considering of going next week too!! Will you join us? Ticket office opens at 4pm on Friday, at 3:30pm on Saturday and Sunday but the festival really only starts about an hour later. The evenings end with a large concert on the main square – this weekend, our friends from La Compagnia della Giostra are playing! 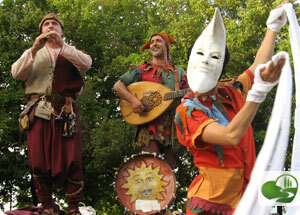 They are awesome, many of the street bands that play at these festivals are great but La Giostra is far and above. So I highly recommend going there and staying the entire evening, just to be able to dance at the end of the night with their music. Again, the festival takes off about an hour after. The main concert will take place Friday night, with Branduardi ending the night. The festival always ends with a big fireworks on the last night, on the 12th. On all days, there are two areas with activities designed for kids – with getting them involved in painting, dancing, dressing up as princesses and knights with wooden swords. I’ve seen the kids at Monteriggioni having loads of fun, so we’ll see tonight what our almost 3 year old toddler thinks of these activities. The festival always has a lot of stands with crafts, showing how things we made in the past, everyone dresses up in costume and you feel as you’re transplanted back in time.A large historical parade around 7pm, with ceremony in the main piazza. Lots of good food and wine flows, music and entertainment – one of the best medieval fairs you can go to, I promise 😉 So enjoy and be merry!! !